Gender quotas are a divisive topic among men and women alike, but the pro camp received a big ole boost today with some seriously senior City women throwing their weight behind them. ‘It’s all taking too long. 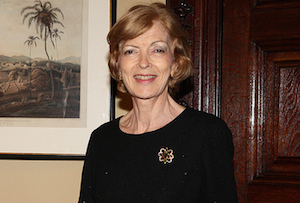 Why not have quotas for a bit?’ former City of London Lord Mayor Fiona Woolf said, responding to an FT poll that found only 19.5% of managing directors or equivalent at more than 30 top City firms were women. ‘Quotas are seen as taboo. But everything the industry has tried for the last 20 years hasn’t really worked. So, in my opinion why not try quotas?’ Sanaz Zaimi, Bank of America Merill Lynch’s global co-head of fixed income, currencies and commodities sales told the FT.
Santander chair Ana Botin, one of the most powerful women in finance globally, wasn’t so sure, but said she supported having at least one woman on every shortlist for senior roles. Investment banks are the worst city firms for promoting women, according to the survey, with only 12% of MDs women. But four asset managers, BlackRock, Fidelity, Pimco and Brevan Howard, wouldn’t even participate. Something to hide praps? Public bodies were markedly better. More than half of the Financial Conduct Authority’s senior managers and 60% of its executive board are women. Over at the Bank of England, female senior managers have increased from 14% to a third under Mark Carney – still not great, but a good start. So the City is still very much a boy’s club, but to many people quotas are a very blunt tool for changing that. Women charging up the ranks, in particular, may well be uncomfortable with the idea that people could see their meteoric rise as down anything other than merit. And quotas may not address the various root causes of the underrepresentation of women: social and self-imposed child raising pressures, a lack of ‘leaning in’ and women being held to higher standards than men. Perversely, the latter could be made even worse by quotas, as those poor underprivileged men see it as women leapfrogging them to the top. Culture change is difficult, if not impossible, to impose, while quotas are hard to undo (think income tax, which was originally meant to be temporary). Voluntary targets, meanwhile, have done pretty well so far at board level. FTSE 100 companies are on target to hit Lord Davies’ goal of 25% of board members being women this year, double what it was in 2010, although that’s mainly down to more independent rather than executive directors. And some banks have their own targets, according to the FT: Lloyds is aiming to increase female senior managers from 28% to 40% by 2020, while Barclays wants to promote 350 more women to the top echelons by 2018, although that would still be only 26%. Clearly, though, the City needs to do more. Naming and shaming will help – and the Government can do a lot to support that. But if there isn’t a big sea change soon, the call for quotas may be too loud to ignore. Get tips on getting to the top from Scotland's top businesswomen, including Newsnight presenter Kirsty Wark and FDS senior partner Jo Haigh. Book now and get 25% off tickets.